Raf Simons goes abstract in its latest sweater offering. The Spring/Summer 2019 Triple Neck Oversized Jacquard Sweater whimsically incorporates three different neck openings on the body of the sweater. 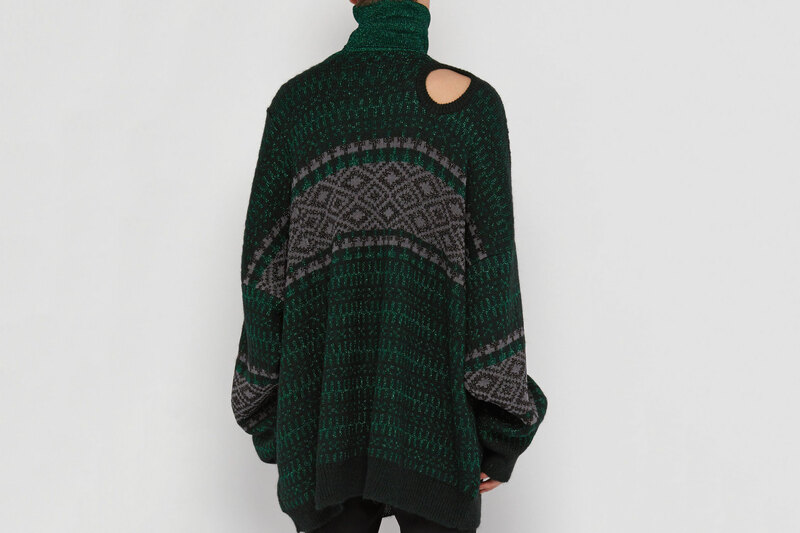 The sweater sees two ribbed-stretch roll necks — one between the shoulders and one haphazardly sewn into the left chest — while a ribbed crewneck opening appears on the back of the right shoulder. The oversized silhouette also features an asymmetrical hem, dropped shoulders, and is made with green and grey metallic jacquard. Those interested can find this over at MATCHESFASHION.COM for a retail price of $829 USD. In other fashion news, Medicom Toy BE@RBRICK & dix team up for a bear-shaped pearl earring. Show your love for the BE@RBRICK in jewelry form. Taking it back to ’90s outdoors. The first new flavor in over a decade. This is a must cop when it drops.